Grab an open-box bargain at only £156.40 - save £9.08! 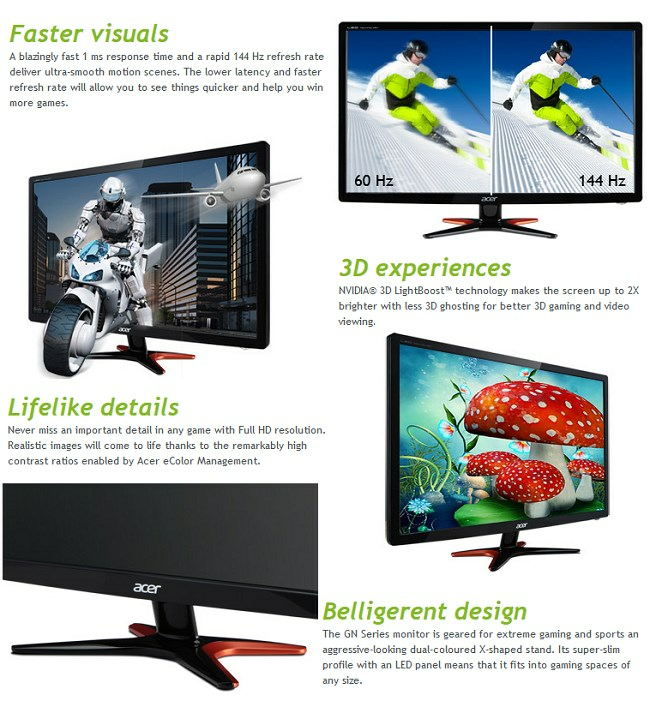 Do you have you a question about the Acer G6 Series GN246HLBbid (24 inch) Full HD LED Backlit LCD Monitor 100M:1 350cd/m2 1920x1080 1ms HDMI/DVI? Q: Can you get the 144hz using DVI-D to display port ? Tower i'm using only offers HDMI and display port, what would be the best way to get 144hz ? Q: Does this monitor come with EU-plug and is this compatible with 230V 50HZ or is it only for British 110V 60HZ? This will only come with a UK plug but is compatible with an EU adapter if once can be obtained. Q: im unsure if this monitor has a headphone jack, is there anyway to connect a speaker to it or will it be soundless when using a console? For the price, it's a steal. Smooth, easy set up. 100% would recommend. Really good pc monitor for this price!!! Wow! To be fair I thought I was buying a passive 3D monitor but this one is active 3D. Am I bothered? No way! This monitor is excellent and by far the best I've ever owned (and coincidentally, the cheapest). The picture is crystal clear and the high definition makes a huge difference. The colours are rich without being glaring and, after slight adjustment to brightness and contrast the lack of 'glare' has helped remove eye-strain from other monitors. It's fairly light, easy to set up and re-positioning and tilting is a breeze. What can I say? Buy it, it's definitely worth it. A 100% satisfied customer. An excellent choice! Great price too. Exceptionally quick dispatch. Since I upgraded from 7 years old budget LCD... This is bright (turned down as much as I could), fast (well 1ms), sharp. I do not see 144Hz, but definitely can see 60Hz. Maybe placebo, but feels better. PC can not keep all games with ultra settings@144Hz, so there can be opions what are you going to favour more. Monitor is simple, classic, sits on old VESA mount, old DVI cable sticked in (check that your DVI is "full"(?) or "double"(?) to get 144Hz out). Excellent monitor, but I have not used anything new and available competitors are 7+ years old. Technologies have improved since then, can see it with unarmed eye (or whatever that saying is).